If you're a beginner to golf, you might be unsure about some of the uses for the scorecard, including the most basic: keeping score. And even if you've been playing the game for some time, there are more advanced methods of marking the scorecard for which you might need a refresher course (such as score keeping when using handicaps, or playing by a different scoring method). Over the following images, we'll show you and tell you how to mark the scorecard for 10 different types of golf score keeping, ranging from very easy to a little tricky. The simplest way to mark the scorecard is very simple indeed: When playing stroke play, count the number of strokes you've taken on the hole just completed, and write that number down in the box corresponding to that hole on the scorecard. At the end of each nine holes, tally up the strokes for your front nine and back nine totals, respectively, then add up those two numbers for your 18-hole score. Some golfers notice that on pro golf broadcasts, and on some websites where the scorecards of tour players are re-created, those cards include some holes where the stroke total has been circled or squared. The circles represent below-par holes and the squares above-par holes. A score that is neither circled nor squared is a par. We're not fans of this method, because it creates a sloppy scorecard. But especially for beginners and mid- and high-handicap golfers, it's pretty pointless. After all, if you're in these categories, you won't be making many (or probably any) birdies; you might not even be making many pars. Your scorecard will be full of nothing but numbers with squares around them. But because it's a PGA Tour thing, some golfers like to do it this way. So one circle represents a birdie, and a score circled twice represents an eagle or better. One square represents a bogey, while a score with two squares drawn around it represents a double-bogey or worse. Many golfers like to keep track of their statistics while playing. The statistics most commonly kept on a scorecard are fairways hit, greens in regulation, and putts taken per hole. Two other stats we like to track are sand saves and strokes taken from 100 yards and in. A sand save is recorded when you get up-and-down out of a bunker (meaning one shot to get out of the bunker, then one putt to get in the hole). Your score on the hole doesn't matter. Even if you get a 9 on the hole, if your last two strokes represented getting up-and-down from a bunker, check off a sand save. We didn't fill in the 100-or-less row in our example above, but like putts, it's simply a counting stat. Add up your strokes played once you've gotten inside 100 yards of the green. That's the scoring zone, and many golfers discover they have a lot of room for improvement by focusing on strokes inside 100 yards. Remember, when we talk about taking strokes on the golf course or scorecard, we're always talking about course handicap, not handicap index. And for the true beginners reading this, "taking strokes" or "taking a stroke" means that your course handicap allows you to reduce your score by one or possibly more strokes on certain holes. Always start by marking the holes on which you get to take a stroke. Make a little dot somewhere within the box for the holes on which your course handicap will be used. (The "handicap" row of the scorecard tells you where to take strokes. If your course handicap is 2, then take a stroke on the holes marked 1 and 2. If it's 8, then on holes designated 1 through 8. More here). If marking the card in the manner of the top example, also divide each of those boxes with a slash. Write down your strokes taken on each hole as you normally would. The gross score (your actual strokes played) goes on top. Then, on holes where you are taking a stroke, write your net score (your actual strokes minus any handicap strokes) below the gross score. When you tally up the total, again write your gross score on top and net score below the gross. Here's what a scorecard looks like when your course handicap is 18 or above, which means that you get to take a stroke on every hole, and sometimes two strokes on a hole. 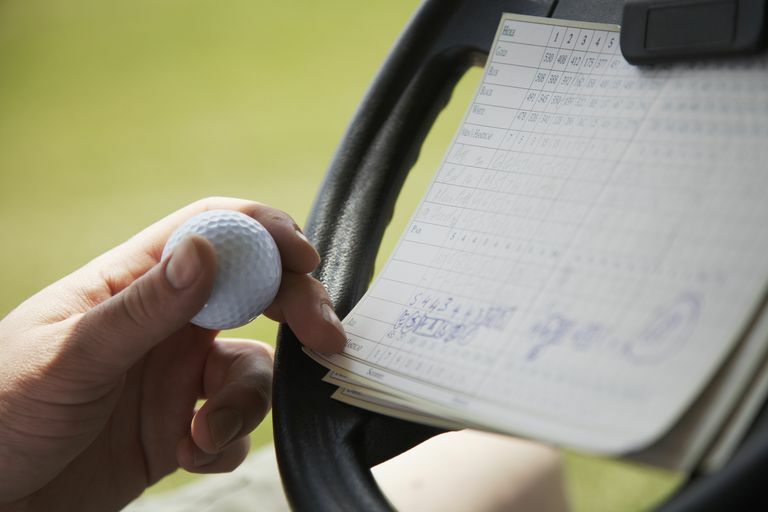 In this case, since you'll be writing down both a gross and net score on each hole, your scorecard will look much tidier and be easier to read if you forego the "slash" method of writing the gross and net in the same box, and put your net scores on a second row. Notice that we still mark our scorecard before the round starts with dots, representing the number of strokes we get to take on each hole. We've shown the front nine of the scorecard up to this point, but the card above is flipped over to the back nine. Take a look at the top row. See the column marked "HCP"? That stands for "handicap," of course, and if this column appears on your scorecard you can forego the dots, slashes, and two-scores-per-hole method we've seen on the previous two pages. If that handicap column appears, just write your course handicap (in our example, "11") in the appropriate box. Mark your actual strokes taken (gross score) on each hole throughout play, then tally up your strokes at the end of the round. In the example above, the total strokes were 85; the course handicap was 11. Subtract 11 from 85 and you have your net score of 74. When playing match play against another golfer, you'll mark your scorecard to show how the match stands in relative terms. Think of it this way: the match starts out "all square" (tied) because neither golfer has yet won a hole. So mark your scorecard "AS" for "all square" so long as the match remains tied. Once someone wins a hole, you'll mark the card "-1" if you lost the hole, or "+1" if you won the hole. This means you are 1-down or 1-up, respectively, in the match. Let's say you're 1-up (so your scorecard reads "+1") and you lose the next hole. Then you're back to "AS." But if you're 1-up and win the next hole, your scorecard now reads "+2" (for 2-up in the match). If a long string of holes is halved (tied), you'll keeping writing the same thing on the scorecard for each hole. For example, you're up by one hole at No. 5. So on the scorecard you've marked Hole 5 as +1. The next five holes are halved. So holes 6 through 10 will also show +1 on your scorecard, because you remained 1-up. The same principals apply to team match play. An example of match play with handicaps is included on the next page. Match play vs. par or bogey describes a match in which you are playing not against a fellow golfer, but against par itself, or bogey itself. In our example above, the match is against par. This means that if you par the hole, you've halved; if you birdie, you've won the hole (because you beat par), and if you bogey you've lost the hole (because par beat you). This is a good game to play when you're on the course by yourself. 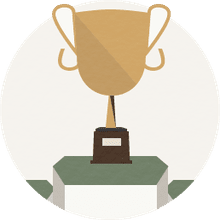 It's common in a match play vs. par, or match play vs. bogey, match to use a system of pluses, minuses, and zeros to denote holes won, lost, or tied, respectively. You can use this system of denoting a match play scorecard at all times, if you prefer it to the AS, +1, and -1 method described on the previous page. Write down a zero (0) if the hole is halved; a plus sign (+) if you win the hole; a minus sign (-) if you lose the hole. At the end of the round, count up the pluses and minuses to get the overall result (if you have two more pluses than minuses, then you beat par or bogey by a score of 2-up). Note that we've included a second row on the scorecard above, showing that this match against par was played using handicaps. Apply the same techniques for handicap use as we saw back on the page about stroke play with handicaps. When handicaps are in play, it's your net score (the score that results after you've deducted any allowed handicap strokes) on a given hole that determines if you've won or lost the hole. The Stableford System is a scoring method in which golfers earn points based on their scores in relation to par on each hole. The Stableford System is a good scoring method for recreational players because there are no negative points—a double-bogey or worse is worth zero, but everything else earns you points. (This is different from Modified Stableford, used on some pro tours, in which negative points do come into play). To mark Stableford on a scorecard, it's most common to use two rows. Using two rows makes the scorecard easier to mark and easier to read later. The top row is your stroke play score—the number of strokes you took to complete the hole. The second row is the Stableford points earned on that hole. At the end of each nine, tally up your Stableford points, and at the end of 18, add your two nines together for your final Stableford score. The point values used in Stableford are found in the Rules of Golf under Rule 32. You can also see them in our Stableford System definition, or view the explanation of Modified Stableford. For Stableford with handicaps, begin by marking the scorecard as you would for plain ol' stroke play using handicaps (as in the top row of the example scorecard, using the dots and slashes). Add a second row to the scorecard and mark it "Stableford - Gross." Then add a third row marked "Stableford - Net." After each hole, calculate your Stableford points based on your gross and net strokes, respectively, and place your points in the appropriate box. At the end of each nine, add up your net Stableford points, then combine at the end of the round for your net Stableford score. You can, if you'd prefer, use just two rows—a top row for strokes, and a second row for Stableford net and gross. In this case, on the Stableford row use slashes to divide the boxes on holes where you'll be taking strokes (same as you would for stroke play, as in the top row above). What Is 'Par Is Your Partner'?